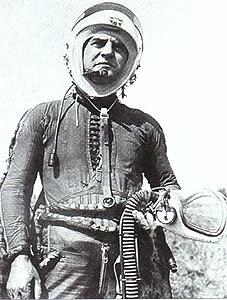 Test pilot Yuri Garnayev wears the KKO-3 suit. Russian pressure suit, operational 1955. The KKO-3 was the first mass-produced Soviet partial pressure suit. It was very similar to the US MC-3 of the same period.